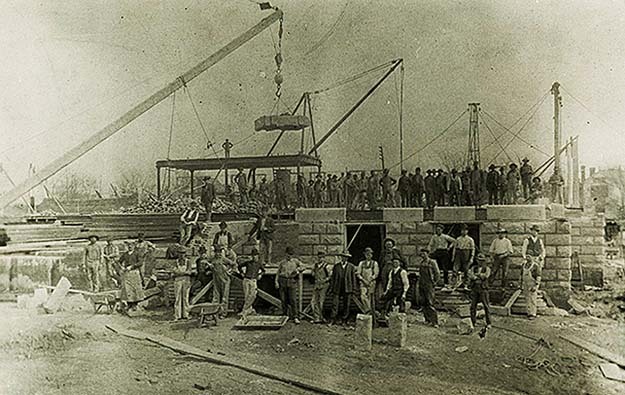 All photos Courtesy of The Texas Collection, Baylor University. 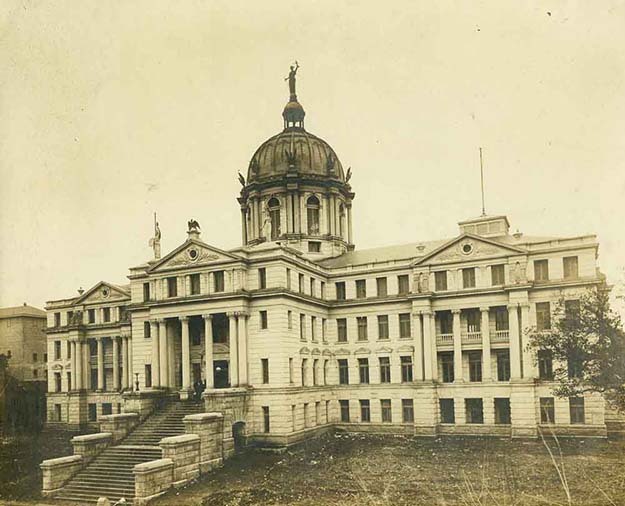 Built in 1901, the McLennan County Courthouse holds pride of place within Waco as not only a functioning center of justice but also the city’s most impressive civic building. 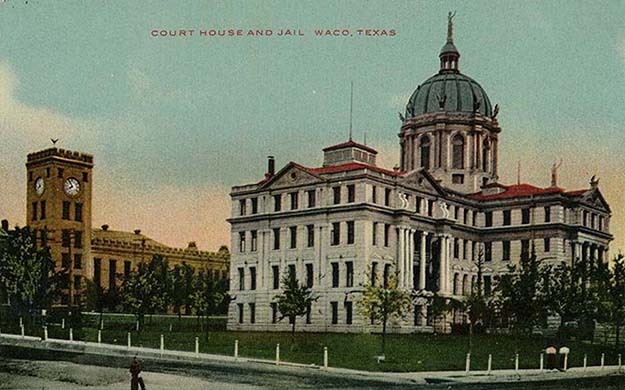 Designed by James Riley Gordon, the renowned architect responsible for the Ellis County Courthouse in Waxahachie and the Arizona State Capital building, the McLennan County Courthouse remains a visual reminder of Waco’s late nineteenth-century status as the "Athens of Texas." This is perhaps best seen in the building’s neoclassical exterior. The courthouse’s pilasters and columns are Corinthian. Dentils, small blocks used as repeating ornaments, adorn the structure’s cornices. Particularly striking are the courthouse’s three justice-themed statues. On top of the central dome stands an imposing likeness of Themis, the Greek goddess of divine order. In her left hand, Themis holds a double-edged sword that represents the law as the chief instrument of justice. Her right hand holds aloft a pair of scales intended to symbolize the weighing of facts in balance by the courts. The other two statues are located on the upper roof below the dome. One is clearly Justitia, the Roman goddess of justice. Justitia is blindfolded to signify the impartiality of the law. The model for the remaining female statue is unknown, although she appears to be a classical variation of Lady Liberty with her striped shield and blazing torch. In addition to its neoclassical elements, the courthouse’s exterior is not without some distinctly regional touches. It is constructed out of white limestone and granite from Texan quarries. A lone star is the centerpiece of the round-headed pediment above the front doors. Perched eagle statues made of zinc surround the main dome. The eagles are wired and contain tiny electric lights in the eyes that were originally intended to glow red at nighttime. The interior of the courthouse is also ornate. The Tenth Court of Civil Appeals features columns made of Kenesaw marble. Stained-glass art pieces with brilliant blue hues and star designs grace the inside ceiling of the dome. Also noteworthy is a mural depicting the history of Waco by local artist Ruth Smith. Commissioned by civic leaders in the late 1960s, the mural chronicles Waco’s development from an Indian settlement in the seventeenth century to a center of higher education and commerce in the mid-twentieth century. 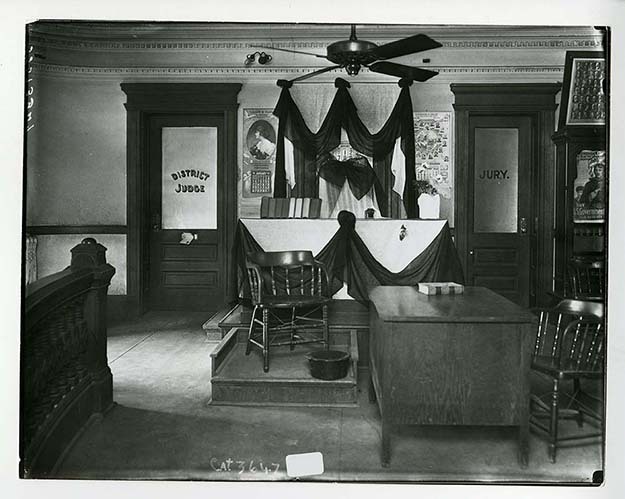 Throughout the courthouse’s long existence, its occupants struggled to balance style with functionality. In addition to its courtrooms, the structure is also the seat of the McLennan County government. As a result, the building is charged with the task of storing the legal records (birth and death certificates, marriage licenses, property deeds, etc.) of the entire county. At first there was more than enough room to house paper copies of the records. However, as the population of McLennan County increased in the mid-twentieth century, the existing office space and cabinetry proved insufficient. To create more space, McLennan County renovated much of the courthouse’s interior. The county also embraced technological advances such as microfilm and computers in order to reduce its dependency on traditional paper storage methods. 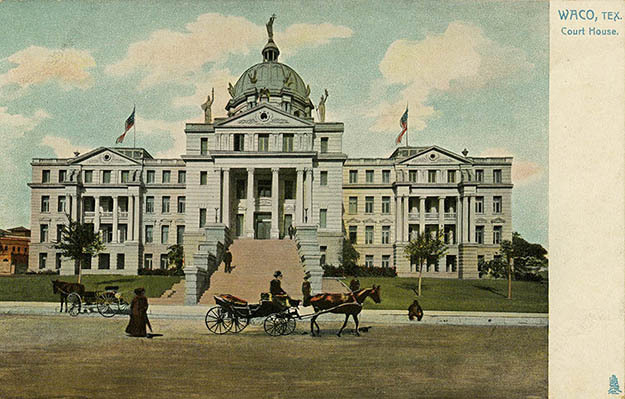 Besides its architectural significance, the courthouse housed many notable legal cases. Clyde Barrow, of Bonnie and Clyde fame, stood trial there in 1930 for numerous criminal charges including burglary and theft. Judge Richard I. Munroe sentenced Barrow to a two-year prison sentence for the above offenses, but Barrow broke out of the McLennan County Jail before he could be transferred to the state jail at Huntsville. Furthermore, the first live televised murder trial took place in the building in December of 1955, when Judge D. W. Bartlett allowed local station KWTX-TV to film the proceedings of the Harry L. Washburn trial in the 54th State District Court. So that it might be preserved for the use of future generations, McLennan County invested in two major courthouse restoration projects within the last decade. County commissioners voted in 2002 to restore Ruth Smith’s mural of Waco history at a cost of $22,000, in order to save it from termite damage. From 2010-2012, the county sponsored a $2.6 million refurbishment of the courthouse roof and dome. 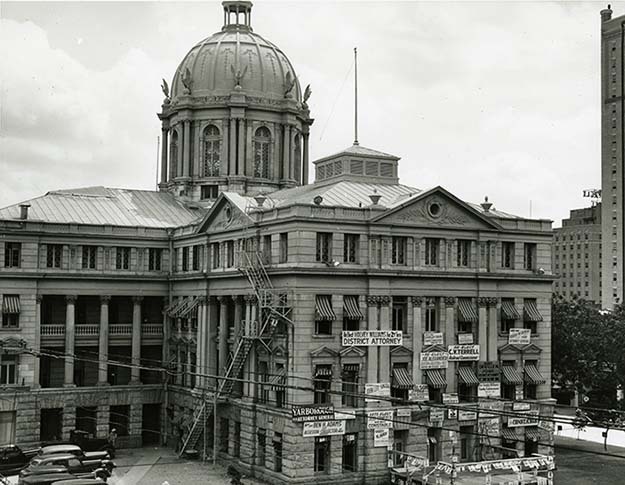 Thanks to these preservation efforts, the courthouse is likely to remain McLennan County’s chief center of justice and civic beauty for years to come.